Renovated 2-room ground floor apartment (ca.40 m2) with sunny large backyard and shared bicycle shed located in the popular district 'Klein Rome' in the Sint Vitussbuurt. This charming house has been completely renovated (now completing phase) and is completely clean and finished. The house is in a very good state of repair, is fully equipped with double glazing and own central heating boiler. 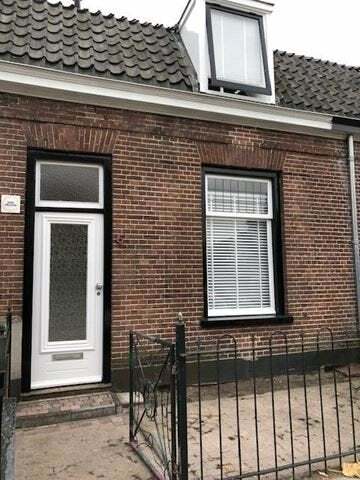 The house is located in a quiet street and within walking distance of shops, restaurants and both station Hilversum Central and station Hilversum Sportpark. From the house you look out on the towers of the Vituss church. In addition, you can park for free here in front of the door! Shared hall with 1 other apartment and stairs to this house. Large living-dining / room with windows and patio doors to the backyard. The garden is neatly delivered, in the photos it is not finished yet. Tight new kitchen for example fridge with freezer drawers, 4-burner gas hob, extractor hood, sink and dishwasher. The bathroom is also accessible from the living room and has a floating toilet, walk-in shower, washbasin with mirror, design radiator and washing machine connection. At the front is a beautiful bright bedroom.